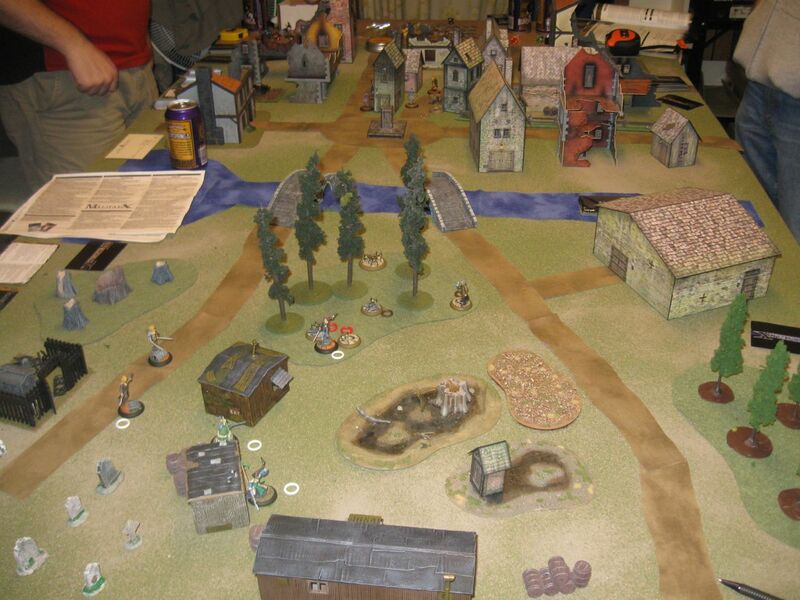 We finally made time to play another game of Malifaux. 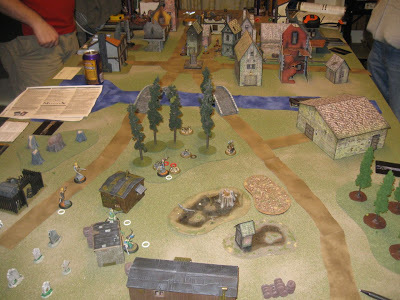 Frank, Andy, JM, and I played two games side-by-side on a 4×6′ board set up with terrain set up for two adjacent 3×3′ boards. This was a good showcase for my Malifaux terrain, so I took some pictures. Frank played his Viktoria crew against my arachnid-heavy Ramos crew. Andy’s Colette box set tried to fend off JM’s Freikorps. Frank crushed me utterly in 4 turns, while JM destroyed Andy’s dancers in 6 turns. After trying and failing to enjoy the Terraclips terrain, we’ve fallen back to using area terrain pieces on a Terrainguy map. The terrain here is an amalgam of pieces from a variety of sources that I’ve collected over the last decade or so. 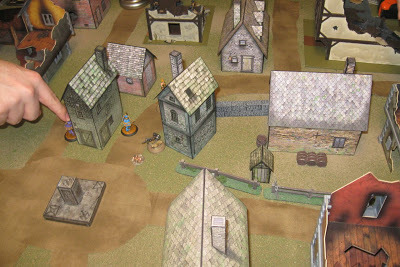 Some of the buildings are Mordheim terrain from the box set. Others are completely scratch built and hand painted by Frank. Some are made from inkjet printed walls glued to foam core. The hobo village around the swamp is plastic O scale railroad terrain. The grave stones and piles of skulls are from Michael’s craft store during Halloween season. The graveyard was scratch built by Frank. There are railroad trees, cast resin stumps, and strips of cloth for roads. The barrels were store bought pre-painted terrain. I scratch built the swamps and rough ground area for dual use with DBA and Malifaux. They’re made of thin plastic with rocky sand glued on, followed by paint and flock. The water areas are done with glossy varnish slopped on over the paint. Frank scratch built the board fences for Warhammer Fantasy, and I built the stone walls using Hirst Arts plaster molds. Overall, I like the way this terrain looks, works, and stores better than Terraclips. I could see adding a few standalone Terraclip buildings to this kind of game board, but I don’t think I’ll be trying to lay out an entire board of Terraclips terrain again any time soon. 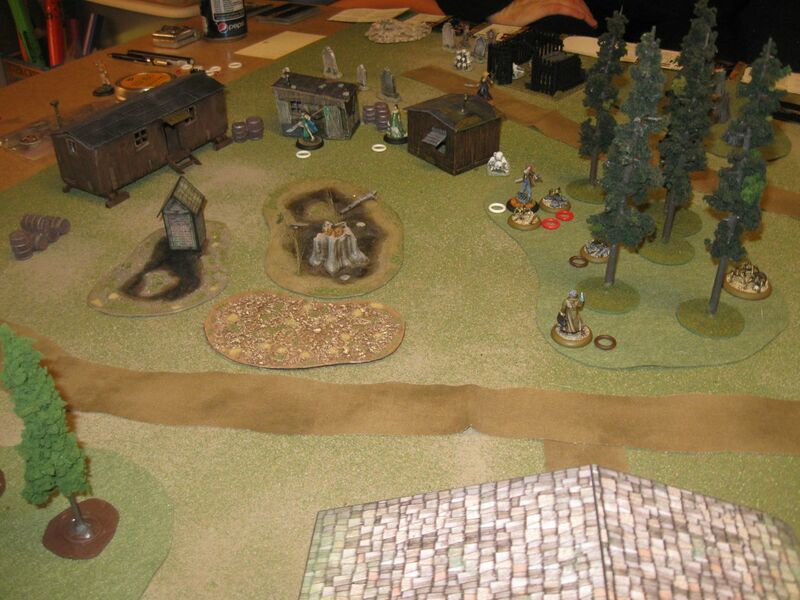 Playing Malifaux reminded us all how much we enjoy the game, and we plan to play again soon. Unfortunately the game seems to be changing faster than we can keep up with, since we don’t play regularly. Luckily it’s still enjoyable with older models.